Forbes.com takes a look at the competition between Square and Flint Mobile. Compass Plus presents instant card issuance in debut appearance at CARTES America conference. SAGE SA names Amir Suleman as Head of Sales for Middle East. Striata receives PCI compliance for its Grade 1 infrastructure in the UK. New Europe Online interviews eToro’s Head of Product Marketing, Alon Levitan, about how eToro is changing online trading. Good.is features SaveUp’s Priya Haji. PEHub interviews Drew Sievers, who led mFoundry to an acquisition by FIS. Fraternity and Sorority Political Action Committee leverages Billhighway Give to Reach Fundraising Goals. Perfectsen selected as a semi-finalist for the Innotribe Startup Challenge 2013. OneID wins 2013 North America Frost & Sullivan Award for New Product Innovation. Come see their presentation at FinovateSpring next week. Locaid earns extended relationship with LaaS company Timesheet Mobile. See Locaid demo at FinovateSpring in San Francisco. VantageScore 3.0 now available from Experian. WattzOn featured in RealtorMag column on energy savings for homeowners. Communications Federal Credit Union to provide Tyfone mobile wallet services to its members. Service2Media‘s M2Active 4.0 selected by Achmea as the “technological cornerstone” for its App Factory. Bank Systems & Technology takes a look at what the acquisition of mFoundry means for FIS‘s future in mobile banking. Bloomberg’s Tech Deals reviews Jemstep Portfolio Manager. Temenos to partner with Caisse Financial Group, providing T24, Insight, Temenos Connect. ACI Worldwide completes Online Resources Corporation acquisition. Standard Chartered Bank moves Africa headquarters from Dubai to Johannesburg. 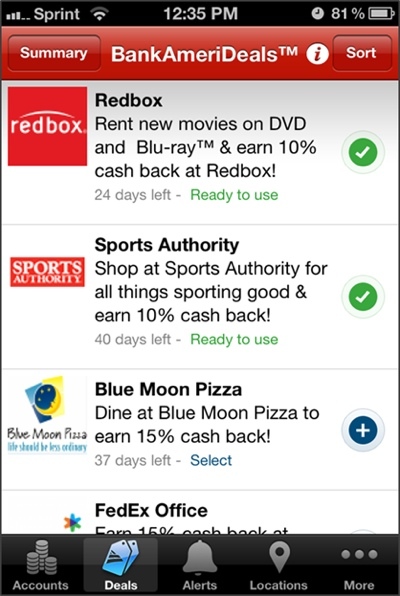 TechCrunch reports: Intuit launching Intuit Pay mobile payments service in the UK. FIS completes acquisition of mFoundry. LearnVest aims to hit 100 planners by year-end. 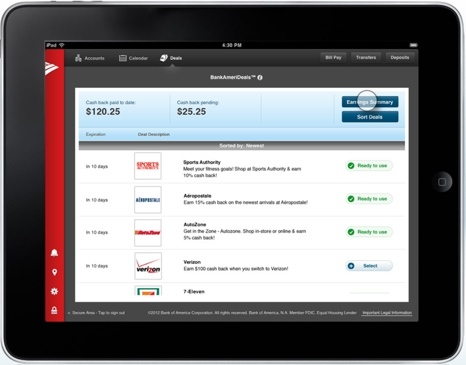 TechCrunch reports: PayPal Here takes on Square Register with new iPad payments app. SafetyPay and giropay join forces to secure internet payments in Germany. TIBCO enhances real time loyalty marketing platform. PrintWeek interviews GMC Software Technology COO Michael Watts. CSI Enterprises set to announce updates to its globalVCard pay systems solution at the Innovation Project 2013 in March. It was a big day for Finovate alumni. ACI Worldwide and FIS, themselves both Finovate alums, rang the register on a couple of smaller fintech companies they hope will make them even bigger players in the online banking and payments world. In an all-cash deal worth $260 million, the purchase of Online Resources will help ACI Worldwide bring broader online banking and full-service bill payment options to its network of financial institutions. The deal is also expected to increase the company’s customer base, with 1,000 banks, billers and other FIs coming along with Online Resources into the ACI Worldwide fold. The combined entity anticipates cost synergies (i.e., saving in operating expenses) of more than $19 million. FIS’s decision to buy the 78% of mFoundry that it did not already known is seen as an opportunity for the company to assert itself in the mobile arena, while expanding its customer base in the process. FIS already has a sizable footprint when it comes to banking and payments technology. And in bringing mFoundry fully on board, the company has helped fuel optimism about the prospects for greater innovation and “convergence” among the various players within the industry. Founded in 2004, mFoundry’s clients include Bank of America, Zions Bank, and more than a third of the top-50 financial institutions in the U.S.
mFoundry and Online Resources both participated in our very first Finovate back in 2007. mFoundry was also on stage more recently at FinovateFall 2010. TechCrunch reports Braintree’s New Payments Layer Lets Users Sign Up For Apps Without Re-Entering Their Credit Card Data. Mitek and Allied Payment Network Expand Availability of Mobile Photo Bill Pay. Backbase and iQStore sign partnership agreement for Russian market. Xero integrates with Harvest, a time tracking and invoicing software company. CNBC’s Squawk on the Street features BOKU. HID Global partners with BehavioSec to improve fraud detection system. FIS acquires mFoundry for $120 million. Facebook integration, customer management features added to Flint mobile app. ACI Worldwide to buy Online Resources for more than $120 million. Last week, I attended BAI Retail Delivery in Washington D.C. where over 200 exhibitors lined the trade show floor of the Walter E. Washington Convention Center. There were 31 Finovate alums on the expo floor, and even more in attendance. My schedule was packed, but I was able to catch up with a handful of Finovate alums. The card-linked offers company is in the middle of a successful mobile deployment effort with BofA, PNC, Regions, and a few other unnamed FIs. After launching their respective rewards programs on mobile, the FIs have seen an increase in user engagement and an increase in the number of online banking visits per user. It is also working on International expansion. So far the top 3 European card issuers have signed. The consumer credit reporting agency recently launched its Insight Score for Retail Banking, a solution that will help FIs generate a risk score for underbanked individuals with no credit data or history. It does this by using non-FI-related payment data from companies like Telco and other TV and cable providers. 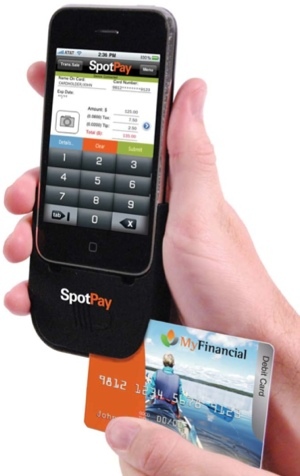 The fintech provider showed me its SpotPay payment dongle and back-end solution. It appears to be Fiserv’s response to Square that it will co-brand with FIs. Fiserv is able to on-board FIs with SpotPay in a couple of days, so it is a quick way for FIs to get into the payments game. While there is an $8.95 per month fee, it is competitively priced, charging only a 1.99% fee on a swipe, and a 3.19% fee on card-not-present transactions. Because volume and sophistication of fraud has grown, Guardian Analytics started bank-sourcing (think crowdsourcing) fraud by bringing multiple institutions together to collaborate on the types of fraud they’re seeing so the whole industry will be better at fighting it. Tiffany Riley, Guardian Analytics’ VP of marketing tells me they’ve received positive feedback so far. Mobile banking solutions company, mFoundry launched its Fin.X platform. This platform can be thought of as a type of app store for FIs to select which products/services they want to include in their mobile app. to white-label their solutions within the Fin.X platform. 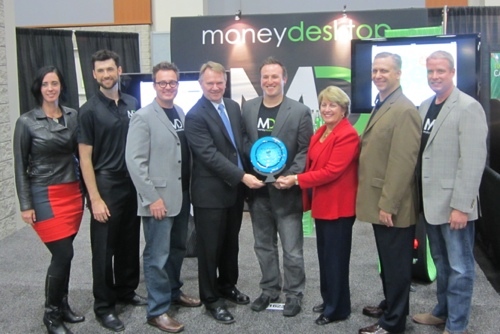 The PFM won CUNA Tech Council’s Best of Show Award at BAI. This counts as its 5th Best of Show award. After the mobile money solutions company acquired Clairmail 3 months ago, Monitise now has 17 million active users. It is in trials of an NFC solution with a few banks. The solution uses a sticker as opposed to a chip inside of the actual device. The electronic banking solutions provider launched Q2clarity, a tablet-optimized dashboard that provides customizable analytics and visibility to how customers are using an FI’s mobile and online platform. Providing these metrics to a branch manager, gives them the ability to make more informed decisions about which products and services to offer. These eight companies are just a fraction of what I saw at BAI this year. For more information on who attended the trade show, visit here. CU Insight reports CU Solutions Group partners with SaveUp. mFoundry announces cloud-based Fin.X solution. Virtual Piggy integrates with Demandware. Taulia featured on Start-ups and Technology: Real Game-Changers presented by SAP. Kashoo CEO, Jim Secord, gives company update. AOL Daily Finance reports Dynamics and UMB increase experience provider rate to 0.5% for ePlate payment system. Business Insider goes behind the scenes of LearnVest’s latest product launch. The Currency Cloud short listed in the Smarta 100/O2 list. Vote for them here. Fenergo launches new online FATCA Self-Certification Tool for W-8 and W-9 form collection. ABABanking Journal profiles Guardian Analytics. Geezeo signs Commonwealth and General. Bank of China (Hong Kong) and Monitise form partnership. Visible Banking interviews Matthias Kroener, Fidor Founder and CEO. Social Lending Network reports: Lending Club cracks $70 mil, Prosper has a down month. North Bay Business Journal lists mFoundry and Monitise as fast growing tech companies in 2012. 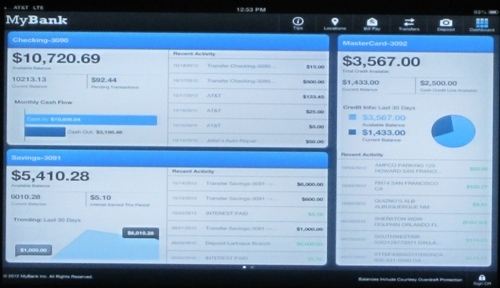 American Banker reports Pacific Continental switches to Q2ebanking as business app provider. Tykoon and LearnVest host contest to help families get money smart. CU Journal reports Minnesota’s Postal CU unveils mFoundry’s M-Banking. Make Use Of blog profiles Expensify. Payments News reports Cardlytics’ System Uses ‘Big Data’ to Deliver Targeted Rewards. TIO Networks launches TIO Connect to simplify onboarding for bill issuers and to open new markets. DemystData locks in Series A funding. Check out VC funding trends in financial services startups. Cartera Commerce raises $12.2 Million in growth equity. Braintree expands payments gateway to merchants in 30 countries. Lending Club receives $15 mil from Kleiner, Mary Meeker joins board. ThreatMetrix positioned as a “Visionary” in the Magic Quadrant for Web Fraud Detection. Clairmail awarded 2012 Best Mobile Application or Service. mFoundry launches mobile banking solution for Eli Lilly Federal Credit Union. City National Bank partners with Cachet Financial Solutions and Panini to deliver RDC to Mac users. Bill.com receivables wins ninth annual Tax and Accounting Technology Innovation Awards.